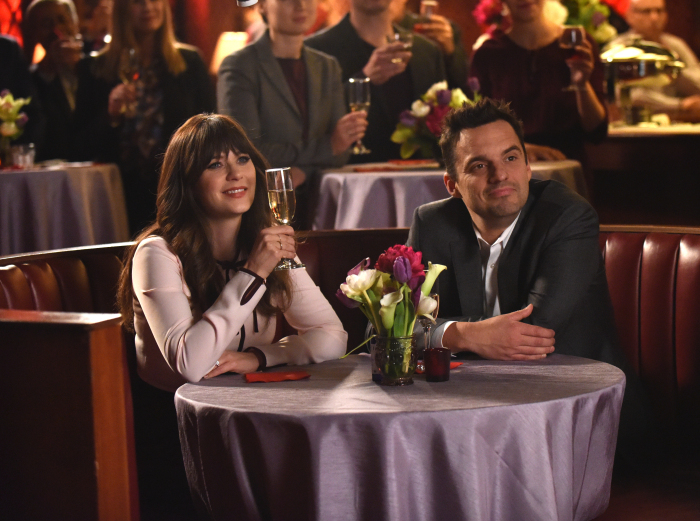 “New Girl” (Fox, 9 p.m.) ends its super short seventh and final season with a one hour series finale in which Zooey Deschanel and Jake Johnson’s characters Jess and Nick finally resolve their long-simmering relationship and the gang from the loft look back as well as decide about the future. A greater irony is found on “Rise” (NBC, 9 p.m.) where just as we reach opening night on the musical, it’s curtains for the series, which has been canceled after one season. Tonight is the last episode. Also ending their seasons tonight are “Blackish” (ABC, 9 p.m.), “Chicago Med” (NBC, 10 p.m.) and “NCIS: New Orleans” (CBS, 9 p.m.), all of which will be back in the fall. Results roll in for the live semifinals of “The Voice” (NBC, 8 p.m.). Lena and Martin try to decide how to celebrate Milo’s birthday on “Splitting Up Together” (ABC, 9:30 p.m.). Becky and Darlene compete for a job on “Roseanne” (ABC, 8 p.m.) and Crystal announces her retirement. A delusion leads to disaster on “Legion” (FX, 10 p.m.). Frankie tries to talk Axl out of talking a job in Denver on “The Middle” (ABC, 8:30 p.m.). “Below Deck Mediterranean” (Bravo, 9 p.m.) returns for a third season. Heroes have to rely on the new inhabitants on “The 100” (The CW, 9 p.m.). On “The Flash” (The CW, 8 p.m.), Barry considers taking on DeVoe by himself. Gibbs finds a friend isn’t dead, but hiding in his fallout shelter on “NCIS” (CBS, 8 p.m.). Gordon Ramsay looks back at the season on “MasterChef Junior: The Road to the Finale” (Fox, 8 p.m.). On “The Last O.G.” (TBS, 10:30 p.m.), Tray tries to support the homeless shelter. Simon is forced to deal with his past on the two-hour third season finale of “Shadowhunters” (Freeform, 8 p.m.). Sandra goes up against the FBI on “For the People” (ABC, 10 p.m.). Chloe wants to ride horses on “Chrisley Knows Best” (USA, 10 p.m.). Meredith Vieira and Matt Baker are co-hosts of “Royal Wedding Watch” (PBS, 10 p.m.), which is on all week. The Andy Hardy series is featured on Turner Classic Movies all night with “A Family Affair” (8 p.m.), “You’re Only Young Once” (9:15 p.m.), “Judge Hardy’s Children” (10:45 p.m.), “Love Finds Andy Hardy” (12:15 a.m.), “Out West with the Hardys” (2 a.m.), “The Hardys Ride High” (3:30 a.m.) and “Andy Hardy Gets Spring Fever” (5 a.m.). It’s Tampa Bay at Washington (NBC Sports, 8 p.m.) in game three of the Stanley Cup Eastern conference finals. It’s game two of Cleveland at Boston (ESPN, 8:30 p.m.) in the NBA Playoffs Eastern conference finals, right after the NBA draft lottery (ESPN, 7:30 p.m.). Baseball includes St. Louis at Minnesota (Fox Sports 1, 8 p.m.). Bicycling’s Tour of California (NBC Sports, 4:30 p.m.) reaches stage three. Kelly Ripa and Ryan Seacrest: Jamie Foxx, Stephen Amell, Mark Bittman. The View: Martha Stewart. The Talk: Scott Bakula, Cameron Mathison, Carrie Ann Inaba, Carnie Wilson. Harry Connick: Sebastian Maniscalco. Steve Harvey: Brooke Burke, Tamar Braxton, Julissa Bermudez. Ellen DeGeneres: Bono, the Edge, Diane Keaton. Wendy Williams: Thalia. The Real: Christina Milian, Natasha Eubanks. Stephen Colbert: Jamie Foxx, Erik Bergstrom, Nathaniel Rateliff & the Night Sweats. Jimmy Kimmel: Melissa McCarthy, Luke Bryan, Cody Bellinger (rerun). Jimmy Fallon: Josh Brolin, Cedric the Entertainer, Dave Itzkoff, Chvrches. Seth Meyers: Ethan Hawke, Ronan Farrow, Jodie Comer, Matt Byrne. James Corden: Hank Azaria, Kyle MacLachlan, George Ezra. Carson Daly: The Sklar Brothers, Ashe, Janet Varney. Trevor Noah: Gayle King. Jordan Klepper: Jonathan Capehart. Conan O’Brien: Nick Kroll, John Mulaney, Olan Rogers, Debra DiGiovanni (rerun).